You’ve probably heard at least a little about the health risks of black mold in home environments. 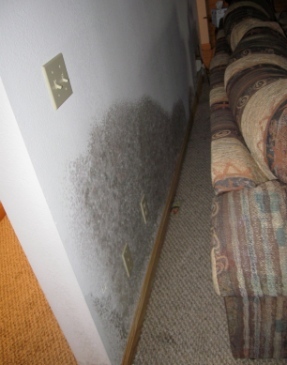 While many types of mold are black in color, when people talk about the danger of black mold, they are usually referring to a type of mold technically named stachybotrys chartarum. While many types of household mold can cause health problems, stachybotrys chartarum may be one of the most harmful to your health. 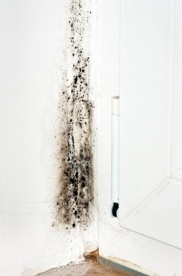 Black mold is sometimes called toxic mold, although the mold itself isn’t really toxic. It produces toxic compounds, though, called mycotoxins, which can make you sick when you inhale them or touch them. It likes to grow in places that stay damp all the time, including air conditioner ducts with lots of condensation, and if you have black mold in your air conditioner ducts, your air conditioner blows it out into the air that you breathe every time it runs. Exposure to black mold can cause numerous health problems, including difficulty breathing, sneezing, coughing, sore throats, itchy and watery eyes, asthma attacks, chronic sinus infections, depression, and fatigue. Symptoms can range in severity from mild to very severe. The danger of black mold exposure is greater for infants and children, elderly people, and those with pre-existing health problems like asthma, cystic fibrosis, other respiratory problems, and disorders of the immune system. Exposure to black mold can make anyone sick, though, even healthy adults. Even your pets can get sick from exposure to stachybotrys chartarum. To prevent health problems related to exposure to black mold, all traces of mold must be removed from the home. Mold often grows in hidden places; if you see some mold, there is a good chance there is more mold you can’t see. Mold can grow inside walls, under carpets, above ceiling tiles, below floorboards, and inside heating and air conditioning ducts. It’s important to remove all traces of mold because if you miss even a little bit, it will just grow and spread and soon you could have a full-blown mold problem on your hands again. It’s often impossible to completely remove mold from porous surfaces like wood and drywall. Those materials need to be removed from the home and replaced. If the wood can't be removed, like wall studs, then they should be cleaned and encapsulated. Other materials, like glass, metal, and non-porous tiles can usually be cleaned. Cleaning moldy surfaces disperses a lot of mold spores into the air, so it can make symptoms of mold-related illness worse. It can also cause mold to spread to other areas of the home. Strict safety protocol must be followed in order to avoid making matters worse in the end. If you have mold-related health problems, or other health problems like asthma that might be made worse by increased exposure to mold, talk to your doctor before attempting to remove mold from your home. The U.S. Environmental Protection Agency (EPA) recommends hiring a mold removal professional if you have black mold (or any other type of mold) covering an area greater than three feet by three feet, if you have mold growing in your heating and air conditioning ducts, if the issue was caused by sewage or contaminated water, or if you have health problems related to mold exposure or health problems that might be made worse if exposed to mold (like asthma or immune system disorders). We suggest scheduling a free consultation with a mold removal professional, even if you plan to handle the mold removal yourself, because you can benefit from some free expert advice. To find mold removal professionals offering free consultations in your area, just follow this link.